Bill Lutz, Generation 3, with daughter, Baby Rose, Generation 4 educating Mt. Airy Day attendees on updating old light switches and electrical sockets. EMAN and WMAN hosted the 43rd annual Mt. Airy Day May 4th on Germantown Ave. on the grounds of Cliveden of the National Trust. Generation 3 Electric, Philly’s friendly neighborhood electrician, was there to show their support of the local community while educating homeowners on energy efficient alternatives to updating their home. 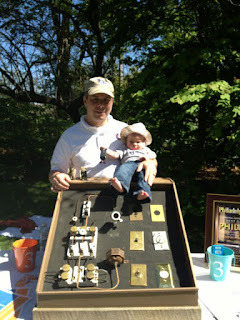 Baby Rose, GEN4, was also there promoting the safety reasons for updating old electrical wiring (knob & tube) in Philadelphia homes built before the 1950s. Bill and Debbie Lutz, owners of GEN3 and fellow Philadelphia residents, have made it their corporate and personal mission to educate homeowners on the benefits of updating the electrical wiring and lighting in their homes. By participating in neighborhood association events, like Mt. Airy Day, their message is helping to keep homeowners safe while respecting the integrity of Philadelphia’s historical residential buildings.